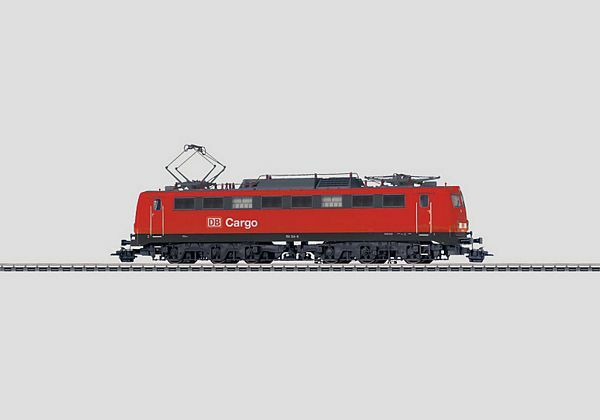 Model: The locomotive has an mfx digital decoder and a controllable locomotive whistle sound. It also has controlled high-efficiency propulsion as a can motor with a bell-shaped armature and a flywheel, centrally-mounted. 4 axles powered through cardan shafts. Traction tires. The triple headlights and dual red marker lights change over with the direction of travel, will work in conventional operation, and can be controlled digitally. The headlights on Locomotive End 2 and 1 can be turned off separately in digital operation. If the headlights at both ends of the locomotive are turned off, then the double A light function is on at both ends. The headlights are maintenance-free, warm white LEDs, and the marker lights are maintenance-free red LEDs. The locomotive has separately applied metal grab irons on the sides and ends. The engineer's cabs and the engine room have interior details in relief. Length over the buffers 22.4 cm / 8-13/16. Rebuilt version without rain gutters. Maintenance-free, warm white LEDs for headlights. Double A light function present if the headlights at both ends of the locomotive are turned off. Telex couplers for remote controlled uncoupling from cars. This model can be found in a DC version in the Trix H0 assortment under item no. 22154.